Sensi Bloom 2-part contains various types of important and less important nutrients. Sensi Bloom in 2 parts is a comprehensive nutrition program for hydroponic and more. 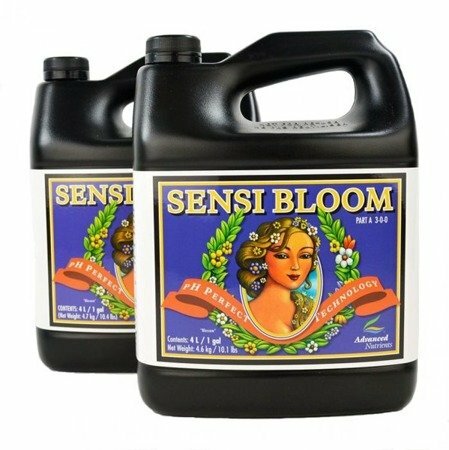 If you want a richer crop and "everything that fits," select Sensi Bloom. SENSI BLOOM PART A: total Nitrogen (N) 3% ((NO3) 2,2%, uera nitrogen 0,8%). Calcium(Ca) 2,1%, water-soluble Magnesium (Mg) 0,6%. Derived from: Calcium Nitrate, Magnesium Nitrate, urea. SENSI BLOOM PART B: total Nitrogen (N) 2% ((NH4) 0,03%, (NO3) 1,7%, uera nitrogen 0,27%), available Phosphat (P2O5) 4%, water-soluble Potassium-Oxide (K2O) 8%. Sulfur (S) 0,4%. Derived from: monoammonium phosphate, monocalcium phosphate, potassium nitrate, potassium sulfate, urea.